At first blush, our La Wares saga may not feel much like a love story in the spirit of Saint Valentine, but as "The Swami Sez" (Chris Berman), "That's why they play the game!" Glad to see this game translated! The more classic turn-based JRPGs translations the better! does this game / patch work on the snes mini ? This one's based on Wares Blade, right? I recall trying that in the D20 system with my buddies. I guess it's a respectable, developed world all things considered, but I'd guess the game wouldn't be too complex still. I remember from the footage I've seen that it seemed rather straightforward. Gonna check this one out either way. 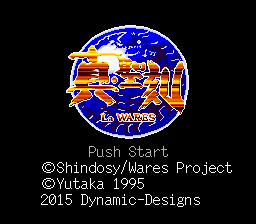 Demi from the resetera forum says: "I've tested La Wares and it loaded just fine for me. I havent played the game to know of any bugs down the road of course. " Great to see yet more obscurities getting knocked out at long last. So where's the RHDN page? The patch is available on DD's site. I'll submit the patch here in a bit if no one else does it first. The game is pretty good. I downloaded the patch when it was released on their site, and I have to say that I like the game quite a bit so far. Upon checking on Dynamic Designs relevant link, I came upon the name Kazuko Tadano. Not only did she design characters for the Sailor Moon anime but she also designed some characters for the anime Dancougar. Haha! I new there was some goodness behind these beautiful character arts in La Wares. Cheers for the hard work Dynamic Designs. What a nice looking RPG, I think this will be a real treat many thx for this. Neat, hadn't heard of her. I'd better take note of that. Pokemon in the '90s might've been the gateway to anime but it's the tip of the iceberg. Fondness for a certain yellow rat and Misty's personality, eventually led me to an '80s precursor to both in Lum. 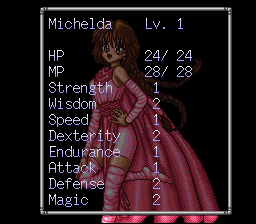 Who in turn can't go without mentioning Akemi Takada when we're talking character design. By the way, what level should you be on by the end of the game? Mid 20s? Great, top notch translation for a below average game. I don't think that's too much to ask of anyone. I do think it's enough to ask of people not to shoehorn rants about American politics into the game. Last time I brought this up I got warned, though, so I'll refrain from elaborating.